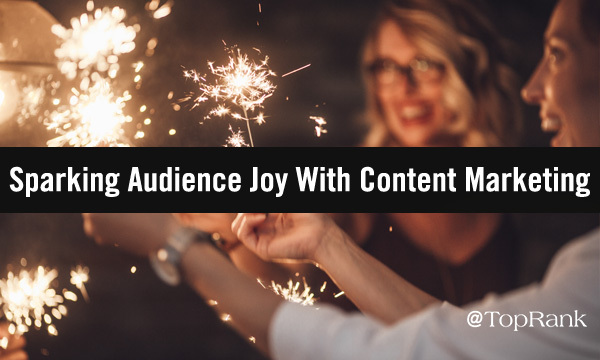 Does Your B2B Content Marketing Spark Joy in Your Audience? Best-selling author, tidying expert, and star of a massively successful Netflix show, Marie Kondo, is really on to something. Her simple yet effective tidying method is brilliant, but what it stands for is what’s truly inspiring. All over the world, people are asking themselves a simple yet powerful question: Does it spark joy? Joy is a powerful emotion—it signals happiness, triumph, and exuberance. And in a time where delivering amazing, personalized experiences to our buyers is the new bar, we need to commit to delighting our audience throughout their journey. When we do this, we not only give them what they want and need, but we can also build a stronger connection with our brands. So, what does it take to spark joy? How do you delight your buyers throughout their journey? Here are a few top tips and considerations. As much as it pains me to say, your audience isn’t hanging on your every word. In a study of their own content, CoSchedule found that only 10-20% of their readers made it to the bottom of the post. Many readers never made it past 20-30% of the way through the post. Look to your own online-reading experiences to give you some perspective here. Odds are, you often skim articles and blogs for the nuggets of information you’re looking for. So, don’t let your content hide those nuggets away. And that’s not to say that you can’t provide a little mystery or intrigue. Your goal should always be to pull your reader through to the end. The real point here is to give them a reason to keep reading. Your customers, prospects, and target buyers are real people. They want transparency and authenticity from the brands they do business with both professionally and personally. They want to work with brands they feel like they know and trust. For marketers, that means connecting on a human level. One way? Make your audience laugh. Laughter reportedly boosts the immune system, relaxes the body, protects the heart, and triggers the release of endorphins. And as longtime marketer and comedian Tim Washer has pointed out: When we can make someone laugh, we make an intimate connection; we show them that we understand their point of view. So, tell a joke, share a personal story, make a pun, share a meme that has relevance and resonance for your audience. It will delight them to know they’re understood. Another way? Connect them with the insights of the people they know, think they know, and trust. Couple general distrust with historical skepticism of marketing and advertising messages, and it’s more imperative than ever for B2B marketers to focus on building trust and credibility with buyers and prospects. Partnering with influential voices and industry thought leaders can help you do just that. All that said, we’d suggest kicking it up another notch to provide joy-worthy experiences. How? With interactive and/or mixed media content. Why? Interactive content is more engaging that static content for the long-term, offering potential drive results at every stage of the funnel. Need an example? Look no further than a “Break Free of Boring B2B” gem that’s affectionately being called “Laser Bear” around these parts. It’s fun. It’s bold. It’s insightful thanks to the several industry thought leaders who contributed. And it allows the reader to choose their own content consumption adventure. Plus, it was paired with a fun teaser trailer to bring the fun to other platforms. Your audience has questions. And you have the opportunity to provide answers—the best answers. Use keyword research, CRM data, web analytics, crowd-sourcing, and other sources of customer insight to guide your content strategy. This ensures the topics you cover and questions you choose to answer are ones that your customers are actually seeking. Spark Joy. Spark Audience Connections. Your audience is hungry for information and connection that informs, engages, and inspires. They want to satisfy their queries, needs, and wants—they want joy. So give them something to be joyful about. What else does it take to be the best answer? Read our guide to creating a Best-Answer Content Strategy.